Dr. Allen Fraley utilizes MyoVision's state of the art technology to objectively care for his patients. DynaROM is used to test for pain as a result of soft issue injury from an auto accident or work injury. Sensors are placed on the skin to measure both how far you can bend, and your muscle guarding response. 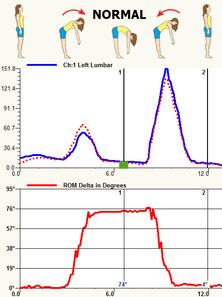 You are required to perform various motions as the sensors graph these measures. This data is used to aid in establishing need for care and tracking your progress over time. This test is completely safe and painless. 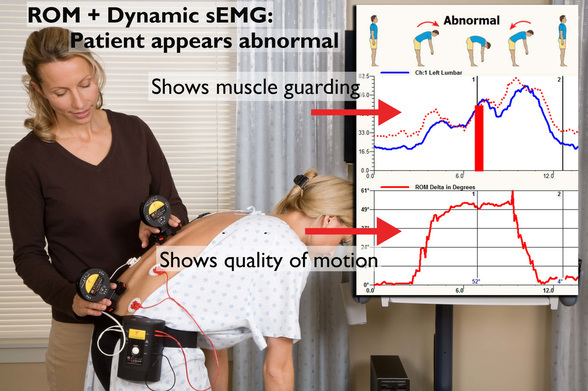 Equipment used in the office is manufactured by MyoVision, and is even featured in the American Medical Association’s “The Practical Guide to Range of Motion Assessment.” It is safe, reliable, and helps to establish the most effective treatment plan to help you get better! DynaROM is the latest in FDA cleared, class II diagnostic equipment. With pain, muscles fire and guard when bent forward. This is an ideal exam. Range of Motion is normal, and there is no muscle guarding when bent forward.